(Nanowerk News) A new photovoltaic energy-conversion system developed at MIT can be powered solely by heat, generating electricity with no sunlight at all. 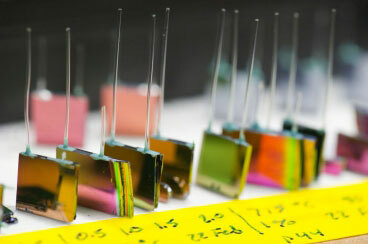 While the principle involved is not new, a novel way of engineering the surface of a material to convert heat into precisely tuned wavelengths of light — selected to match the wavelengths that photovoltaic cells can best convert to electricity — makes the new system much more efficient than previous versions. The key to this fine-tuned light emission, described in the journal Physical Review A ("Tailoring thermal emission via Q matching of photonic crystal resonances"), lies in a material with billions of nanoscale pits etched on its surface. When the material absorbs heat — whether from the sun, a hydrocarbon fuel, a decaying radioisotope or any other source — the pitted surface radiates energy primarily at these carefully chosen wavelengths. According to the U.S. Energy Information Administration, 92 percent of all the energy we use involves converting heat into mechanical energy, and then often into electricity — such as using fuel to boil water to turn a turbine, which is attached to a generator. But today's mechanical systems have relatively low efficiency, and can't be scaled down to the small sizes needed for devices such as sensors, smartphones or medical monitors. The solution, Celanovic says, is to design a thermal emitter that radiates only the wavelengths that the PV diode can absorb and convert into electricity, while suppressing other wavelengths. "But how do we find a material that has this magical property of emitting only at the wavelengths that we want?" asks Marin Solja?i?, professor of physics and ISN researcher. The answer: Make a photonic crystal by taking a sample of material and create some nanoscale features on its surface — say, a regularly repeating pattern of holes or ridges — so light propagates through the sample in a dramatically different way. "By choosing how we design the nanostructure, we can create materials that have novel optical properties," Solja?i? says. "This gives us the ability to control and manipulate the behavior of light." The button-like device that uses hydrocarbon fuels such as butane or propane as its heat source — known as a micro-TPV power generator — has at its heart a "micro-reactor" designed by Klavs Jensen, the Warren K. Lewis Professor of Chemical Engineering, and fabricated in the Microsystems Technology Laboratories. While the device achieves a fuel-to-electricity conversion efficiency three times greater than that of a lithium-ion battery of the same size and weight, Celanovic is confident that with further work his team can triple the current energy density. "At that point, our TPV generator could power your smartphone for a whole week without being recharged," he says. Celanovic and Solja?i? stress that building practical systems requires integrating many technologies and fields of expertise. "It's a really multidisciplinary effort," Celanovic says. "And it's a neat example of how fundamental research in materials can result in new performance that enables a whole spectrum of applications for efficient energy conversion."